I seem to have a thing for piercings. Don't really know where I got it from..No one in my family likes it..OK I just realized why.. 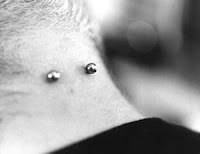 I remeber when I first saw a neck piercing. It was eye catching to say the least. Nothing I would want though..